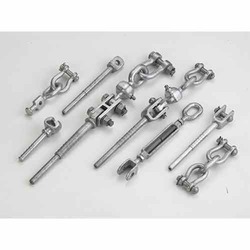 Manufacturer of a wide range of products which include dead end fittings. Being a well established organization, we bring forth an excellent assortment of Dead End Fittings. Our offered range is widely appreciated by our prestigious clients for their precise design and durability. The offered range can also be availed in various sizes, designs and other related specifications. Our provided range is manufactured by a team of our adept professionals utilizing quality approved raw material and advanced technology. Clients can avail the entire range from us at industrial leading rates.